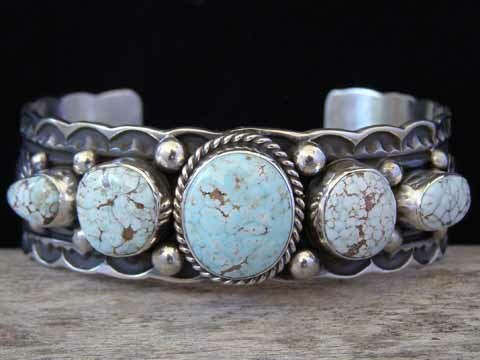 This five-stone graduated row bracelet is set with well-matched stones of natural, untreated Dry Creek turquoise from Nevada. All of the stones are marked by webbed matrix and beautifully polished to glassy smoothness. This Nevada turquoise is characterized by its hardness and fracture resistance. The stones are set in smooth bezels and the center stone is wrapped with twist wire. Raindrops are interspersed between the stone sets along the edges of the cuff. Deep-stamped traditional stampwork further decorates the cuff and highlights the scalloped edges of this cuff. The silverwork has a nice patina which gives it an old-style look. Stones: center 11/16" x 9/16"; left & right 1/2" x 7/16"; far left & far right 7/16" x 1/4"